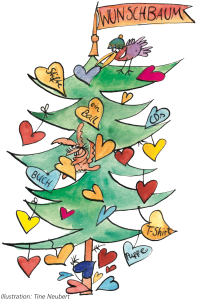 Since 2011 visitors can pick and fullfill wishes at Schwabing christmas market from a „wishing tree“. These whishes were from children from low-income families, living in Munich and were worth around 20.- € each. Since 2017 KulturKinder, a project from KulturRaum e.V., is our partner for this social project. From 2019 on this cooperation with KulturRaum will be named “cultural wishing tree”. Our visitors can now pick and fullfill wishes for cultural events for children from low-income families, as well as for adults with a low income. These wishes/ events will cost around 20.- € each. A team from KulturRaum will be present at Schwabing Christmas Market every day in a stall next to our music stage.